“Remember when there was a time without all these blasted robots?” You’ll ask, receiving no response since everyone you know will have been replaced by robots. If nothing is scarier to you than intelligent robots, this next story is going to bring you night terrors. It hasn’t been that long since cloud computing and cloud storage revolutionized networking and remote storage, but robots now have that same capability, as the Rapyuta launches globally. Rapyuta, which takes its name from Hayao Miyazaki’s animated masterpiece Castle in the Sky, is a web-based data network that more or less serves as an expansive how-to guide on doing just about anything that robots can do. The robot doesn’t even have to be intelligent anymore since any bit of information it needs is right at its grubby, metal fingertips. Say a bot needed to clean all the windows on the Empire State Building. Somebody somewhere input the information detailing the number of windows on the skyscraper, and the size of each, and the robot will know exactly the area of the windows it’ll be cleaning. The same goes for it frying an egg, putting together a model airplane, or reattaching a muffler. If the information is out there, the robot can retrieve it, and since the information won’t be a part of the robot’s circuitry, this will free up memory storage and be a much cheaper alternative to loading them up with tons of digital information and processors to make all that info functional. Even though the best bar I’ve ever been to has been closed for years, I still recall it fondly. While I’ve been buddies with bartenders before, this was the only place where I became friends with almost everyone who ended up working there. The 6 a.m. closing time may have helped that. 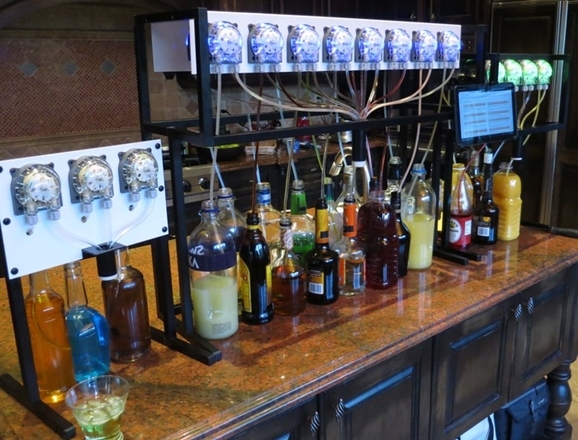 If you’d have asked me then how I’d have felt about replacing any of them with a bartending robot, I would have been aghast, then curious, then signing whatever dotted line I needed to. Sorry, friends! The days of cops risking their lives in dangerous situations involving armed suspects could see an end in the distant future, as our lifeless, robotic brethren are becoming advanced enough to step into the line of fire for us. And by “us” I mean people braver than me, because I’ll be far away from that line of fire, appeasing the Robot Gods by throwing virginal females into a dumpster full of computer parts. Waverly, Ohio resident Michael Blevins recently had the cops called to his residence to follow up on a complaint that a gunshot and loud threats were heard coming from inside the man’s home. After hours of failed communications, the police, believing Blevins to have several weapons on the premises, decided to evacuate the surrounding houses and send a police robot inside Blevin’s home. Once the suspect was located, a larger robot was sent in, and the highly intoxicated Blevins opened fire on the robot with a small caliber pistol. I would assume he went for the head, since we all know Tin Men don’t have hearts, but since he was dumb enough to shoot a robot in the first place, all assumptions are off. two counts of unlawful possession of a dangerous ordnance (for two AK-47 style rifles and an illegal bullet drum), vandalism of government property, and a few other charges. He should be lucky the robot didn’t stick a finger in the gun barrel, thus making it explode in Blevins’ face. That happens right? If we learned anything from the fiasco that followed Orson Welles’ 1938 radio broadcast of <I>The War of the Worlds</I>, it’s that we must constantly keep reminding ourselves of the differences between art and reality. Before viewing the following pictures, use this as your mantra: It’s only an illustration. It’s only an illustration. For now. 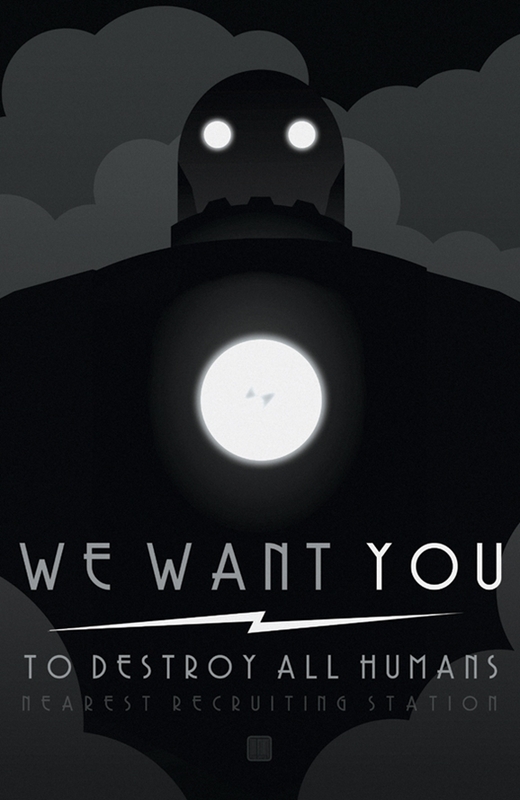 Animator, illustrator and deviantART user Tom Kyzivat’s posters of Giant Freakin’ Robots ominously calling for humanity’s doom recall the early days of non-charming robots, using Fritz Lang as an obvious influence. Though the images aren’t new, they’re particularly timeless and beautiful, and also prove that, no matter what you think you’re expecting, robots will always be one step ahead. Meet BigDog. BigDog may very well give you nightmares, or at least further your paranoia that, day by day, robots are inching closer and closer to staging a violent coup and taking over the world. Now they’re learning to throw, and not just to throw ball or how to play catch with you kids in the back yard when you’re too busy, this guy chucks cinder blocks all over the place, for fun. Similar to their pack mule robot, Boston Dynamics went ahead and added a throwing arm, for some reason. Maybe their end game is to create an automaton to perform mindless repetitive tasks like stacking sandbags during a disaster like a flood or a hurricane. That makes sense, but we’ve all seen enough movies that we know the ultimate result will be that the robots become sentient and rise up against their human overlords in open revolt. We’ve all been there: stranded, needing to get across a random body of water, but alas, there’s not a bridge in sight. Well, this swarm of autonomous, water-borne robots may be just the answer you’re looking for. Check out this video of this fleet of robots—called the Tactically Expandable Maritime Platform, or TEMP—coming together to build a custom bridge.